A Peek Inside The Creative Corner: Great use of Snowmen "Toppers"
Great use of Snowmen "Toppers"
These toppers are simply great if you want to mass produce some tags or cards. These snowmen are so cute, made of excellent card stock quality, already pre-cut for you and with gold foil and glitter! You get 10 different snowmen in the package! Each snowman is package in an envelop with the 3 layering pieces! You just take one envelope out and put the guys together. (only 3 layers to build!) 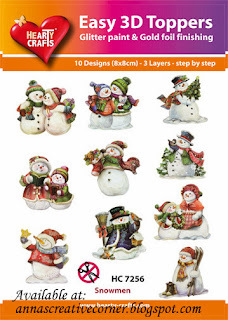 Layer the completed snowman on a tag or continue making a card. Soooooo simple and quick! I know I will make 10 quick cards and have these guys ready for sending out in December! And the whole package of 10 snowmen go for only $8.25! And to see how nice and quick these are, come by on Saturday, September 28 and make a tag!!! You are going to fall in love with these guys! Yes, since it is now count down to Christmas making ideas, I will try to have as many Make and Takes for you! Next Saturday, October 5 will be a Pergamano Make and Take!!! I'll post that tomorrow! ALSO, on Saturday, October 5 at 1PM, we'll have the very popular, Tag You're It class!!! Come and make several Christmas tags PLUS a tag for a wine bottle that you will be able to use for Thanksgiving! 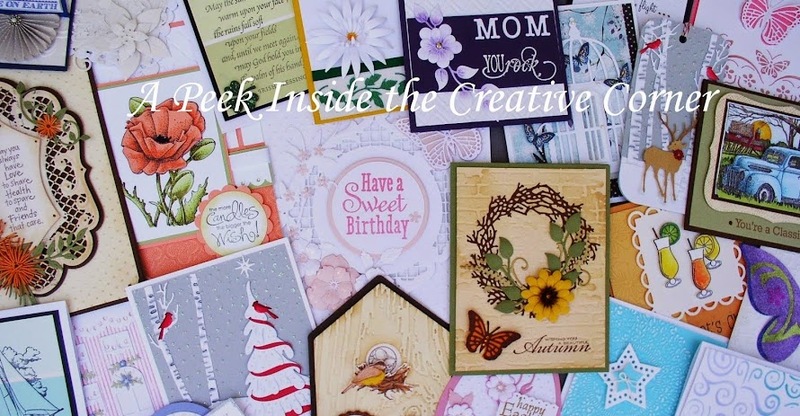 Fall is here and the Creative Corner is here to help you make your holidays fun and creative!! !